The official name of Sky Garden is “61 Legian”, a huge entertainment complex with 7 different areas and Sky Garden is just one of them (the rooftop on top of the building). This multilevel palace of flash flirts with height restrictions from its rooftop bar where all of Kuta twinkles around you. Look for top DJs, a ground-level cafe and paparazzi wannabes. Munchers can enjoy a long menu of bar snacks and meals (salads, sandwiches, pastas and the like). Most, however, roam from floor to floor posing with posers and having a blast. 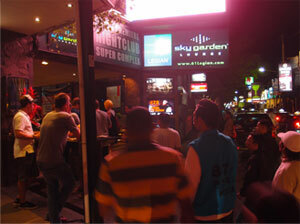 Despite the gloss, it can get quite rowdy at night when Kuta and legian starts thumping. The design of the whole ensemble is remarkable, exactly how I like a club to be: It is easy to get lost, or meet people as you walk from one room to the next, entering each time in a different atmosphere. The crowd is dominated by Australians in their 20s, followed by Indonesians (among which some working girls). It gets crazy on most nights, and you should not be surprised to see a few people being escorted out because they are too drunk to stand on their feet. STANDING : 8 venues – 4 storeys building. MUSIC TYPE: SkyGarden is normally house, Bradys is R&B, and Skydome has major international DJs coming in on a Fri and Sat performing a range of different styles. AVERAGE DRINK PRICES : Drinks vary in Price but before midnight price where most drinks are 20000 RP cheaper. Most popular Drinks after midnight are Sunset Drinks 75000 RP, Triple Fruit Shakers 90000, Triple Smirnoff Chiller 90000 RP. 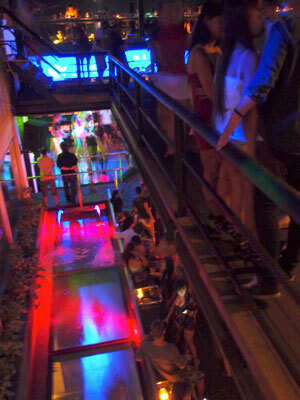 The rest of the club SkyGarden opens @ 6pm and every other floor @9m all until 3am.